This paper considers issues of non-linear mathematical simulation of dynamic processes in the positional hydraulic servo power drive with long connecting pipelines. 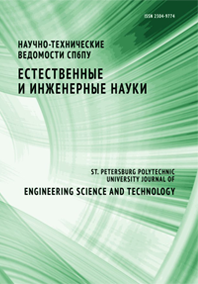 The study proposes a method for numerical calculation of the dynamics of the power drive when describing non-movement of the working fluid in pipelines with distributed settings, allowing for the restructuring of the speed profile in the flow section. The general mathematical model of the power drive is obtained by using the Euler numerical method and the method of characteristics. The mathematical model for the servo power drive and the design method behind its dynamic processes, their adequacy and efficiency have been validated through the experimental research. Гидравлический следящий привод; математическая модель; динамические процесы; расчет.